My 11-year-old son and nine-year-old daughter never participate in household chores. They have very little expected of them – like making their beds – yet even this is often left undone. I feel like they tune me out when I try to talk about this. I’m sick and tired of doing everything for them and not feeling any reciprocation. Help me Sara! It’s easy to feel like a maid to our children when they expect us to tidy up after them. When children are very little, they want to pitch in. Most love standing on a stool with their hands immersed in warm sudsy water and dirty dishes or sorting through socks to fi nd matching pairs. Their help is sometimes more of a hindrance and it’s normal to feel guilty if we don’t always want it. However, I am not convinced that there is a correlation between the chores a child helps you with at age four and the level of motivation to help at 11. At four, your child wants to engage with you and wants to feel helpful and constructive. At 11, your child wants to be left alone and doesn’t care about the unmade bed, clothes on the fl oor or dishes in the sink. Your children may not purposely be going against you, but may not see the same mess that you see. Understand that their priorities and perceptions are different than yours. Then, modify your expectations. Let them know that you are tired of nagging and yelling. In a calm but authoritative voice, tell them you would appreciate their help in coming up with a “solution” to some “problems”. Encourage brainstorming for solutions even if they sound ludicrous at first. For example, if your son suggests paying his sister to hang up his clothes, maybe that’s not such a bad idea! Other solutions may include choosing particular days on which everyone spends a half hour hanging up clothes that have been draped over chairs. In our home, our laundry system works well because it is clear and consistent. Our children are responsible for bringing hampers from each bedroom into the laundry room on Sunday afternoon, sorting through the clothes according to colour and type and placing the underwear and socks into the washing machine. We bought a large three compartment laundry sorter to make organizing easier. I wash and fold the laundry and my husband puts it away. Although they may not admit it, contributing around the house actually helps children feel that they are vital, important members of the family and that without their help, the system might fall apart. The bottom line: If you keep tidying up after your children because it’s easier and quicker, they will never feel the need to clean up after themselves. So, get together as a family to set up systems in advance, along with logical consequences for not following through, and then let your plan do the talking. Originally published in ParentsCanada magazine, July 2013. Timeout with Nanny Robina: Should a Child Get Paid For Chores? 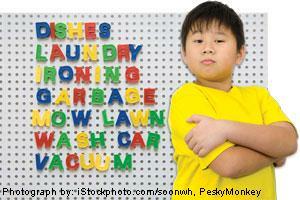 Oh, Behave: What age should a child be assigned small household chores?